Select Size: Select One SLB362/400 - $106.50 per Box 50 Qty. SLB600 - $190.50 per Box 50 Qty. SLB600-10 - $140.00 per Box 25 Qty. SLB600-12 - $161.75 per Box 25 Qty. SLB800 - $238.50 per Box 50 Qty. SLB1000 - $171.75 per Box 25 Qty. SLB1200 - $185.00 per Box 25 Qty. • VertiClip SLB is minimum 14 ga (68 mil) while competitors are 16 ga (54 mil), making it the strongest bypass clip on the market! VertiClip® SLB Light Gauge Steel Connector is used to connect exterior curtain wall metal studs, bypassing the building structure, while allowing for vertical deflection of the structure up to 2” (1” up and 1” down). 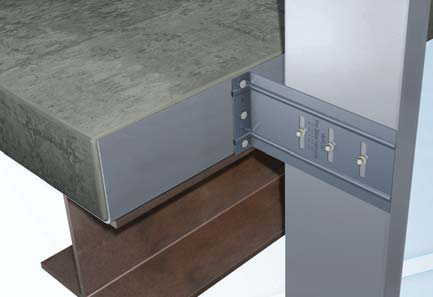 VertiClip’s unique design provides both an anti-friction and anti-seizure connection between the steel clip and the stud web surface thereby preventing a transfer of vertical forces into curtain wall steel framing, which is not engineered to support axial loads. VertiClip SLB Bypass Steel Clip eliminates flange-loaded, friction-fit clips, which do not address web-crippling. Allowable loads are based on use of two #12 screws for attachment to stud (#12 screws provided with order). 1. Place VertiClip® angle against structural pour stop. 2. Attach SLB to structure with required fasteners. 3. Fasten SLB to stud with provided screws through Step Bushings. 65ksi (450MPa) minimum tensile strength, 68mil minimum thickness (14 gauge, 0.0713” design thickness) with ASTM A653/A653M G90 (Z275) hot dipped galvanized coating. The attachment of VertiClip to the primary structure may be made with PAFs, screw/bolt anchors or weld and is dependent upon the base material (steel or concrete) and the design configuration. Step Bushing Technology Step Bushing Technology® Code-Compliant Load Rated Attachments - TSN's Vertical Deflection products utilize patented Step Bushings ICC Evaluation Report ICC Evaluation Report ESR-2049 - An ICC-ES Evaluation Reportfor VertiClip® SLB600 is available Blast & Seismic Design Data Blast & Seismic Design The Steel Network is the only connector manufacturer in the US that has rated its connector products for special seismic and blast design by providing tables with LRFD design strength, nominal strength and ultimate strength for each connector.